Why hike to Foresta Falls? Tired of fighting the tour buses to get to Yosemite's big waterfalls? Here's one you're likely to have all to yourself, and it's only a few miles from Yosemite Valley. Crowd Factor: Light. One of Yosemite's least visited waterfalls. 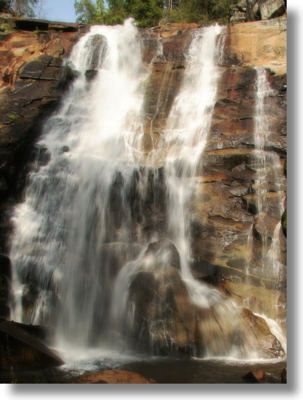 Scenery Summary: Foresta Falls descends about 200 feet (60 meters) in a series of cascades covering half a mile. It's capped off by a 40 foot (12 meter) plunge, pictured here, that gives way to a 20 foot (6 meter) cascade. You'll have to go off-trail to get close views of the upstream cascades, but you can just stroll across a bridge to get sprayed by the mist from the grand finale. Difficulty: Foresta Falls is an easy walk down Foresta Road, a one-lane dirt road that can take you all the way to El Portal if you've got the energy (or a mountain bike). The difficulty level goes up if you decide to go bushwhacking for closer looks at the upper cascades. Best time to visit: Assuming you prefer waterfalls to bare cliffs, go during snowmelt in the springtime, when water flow is at its peak. Nearest Bathrooms: At Bridalveil Fall, 6.5 miles (10.5 km) away. Nearest Snacks: At Crane Flat, 8.5 miles (13 km) away, or in Yosemite Village, 12 miles (19 km) away. Driving Directions: From Yosemite Valley, take the highway 120 turnoff towards Tioga Road. After 3.3 miles (5.3 km), you'll pass a signed turn to Foresta. Follow this road until the pavement ends 2.2 miles (3.5 km) later at the far end of Foresta, and park at the pullout. Parking: There's a small pullout at pavement's end, where the trail begins, that fits a couple cars. If it's full, you can park at the intersection of the Foresta Road and the old Coulterville Road, half a mile back at the other end of Foresta. Trail Notes: The trail is actually a dirt road leading from Foresta to El Portal. It goes downstream alongside the creek for most of the route, then feints away to pass beside a meadow before returning to cross the creek at the falls' climax. The falls start shortly after you pass a row of five boulders beside the road. If you're determined to depart the trail and explore the upper falls, wait until you've reached this spot. For the most part, you won't get to see the upper cascades from the road, but there is one place from which you'll get a view of one of the best of them, albeit from about 50 meters away. You won't miss it on the return trip, but you might not see it on the route to the falls unless you're looking back over your shoulder as you go. Hazards: If you go off trail to explore the upper cascades, you'll have to scramble through lots of brush, and there are ticks and poison oak here. The granite shelves over which the cascades flow are smooth and slippery in many places. What's Foresta? Foresta is one of three islands of private property within Yosemite (the others are at Aspen Valley and Wawona). It was purchased by the Foresta Land Company in 1912 from the estate of James McCauley, whose property ownership predated the establishment of Yosemite as a national park. Promoter A. B. Davis envisioned a summer resort on the property, but the project failed and all that remains are a few dozen private homes. Although Davis is no longer alive to hear it, you can't help but praise him for coining such a creative name for Foresta. A less visionary developer would have chosen something ordinary like "Treesa" or "Woodsa".